Company ABC today is proud to announce two new phones, the XYZ Prime and the XYZ Prime Plus. With 5" and 5.5" 1080p touchscreens and Snapdragon 617 chipsets, these two new Android 6 smartphones wow with their metallic finish, 13MP HDR-capable cameras, 2GB RAM, and flexible storage, the second nanoSIM slot can double to accept microSD. It comes with a range of covers and comes in 'dark grey, silver and champagne gold'. Sound familiar? These devices will all look near identical too, touch slabs with iPhone-esque antenna lines, iPhone-esque curves and often with iPhone-esque UI nods too (Huawei/Honor even foregoes an app list/drawer). It's all a bit depressing. Not just for me or you, but for the industry as a whole - smartphones are now so similar that it makes very little difference which one you buy (away from the extreme bottom end) and the main differentiator is price, which doesn't bode well for anyone's profit margins. It also makes smartphones very hard to fall in love with. Yes, I know that's a strange statement to come out with, but I'm sure that everyone reading this has a favourite phone of days gone by, a phone which wasn't just a slice of high tech but seemed to have a character, a personality of its own. Something that you felt at one with, which you were happy to hold and cherish, more than a simple communications tool, a phone which fitted your needs better than anything else on the market? The Nokia N93 (top middle), with its 'TV mode', camcorder modes, flip phone modes, the N93 took lovely photos and video with stereo sound - too bad the actual smartphone experience was horribly crippled by the lack of RAM (a common Nokia trait, sadly). But nevertheless, every moment I picked up the N93 I had a sense of this being ultra-cool, of owning something exclusive, something special. The Marshall London (just below the N93) retains one of my main SIMs to this day, even though it's patently outgunned by everything else from 2015 and 2016, because of the rubberised case, the stereo speakers with incredible fidelity and, yes, the Marshall logos - on the front, back, and even on the battery. It's just such a cool phone to own and use. Any number of the Nokia QWERTY-keyboarded smartphones and communicators, but I'll pick out the Nokia E75 here (top right, in red! ), the slide-out transformation from T9 candybar to QWERTY input was very well done and the keyboard surprisingly easy to type on - all in a very small physical form. As with most of the other phones here, it was also quite rare, so there was always the 'exclusivity' factor when typing on it in public! But just to show that I hold no malice for the iPhone, I've put in the black iPhone 5s above too - the recent larger iPhones are so generic in form factor, plus they've been 'copied' so much, while the older iPhone 5 range were precision machined and always felt premium - and personal - in the hand. These days there's even a SE model with the same form, if you really do want to go down this route. The Nokia Lumia 1020 - I'd go so far as to say that this is the only Lumia/Windows Phone with any real character of its own - it was an evolution of the 'fabula' 800/920 (and others) design, but perfectly proportioned with that glorious and purposeful black camera circle on the back, housing the Xenon flash and monster 1/1.5" 41MP sensor with OIS that takes unbelievably good 'Pure' 5MP oversampled photos. True, general operation is slow by 2016 standards, especially shot to show times in the camera, but even today I have my third (yes, ahem, third!) SIM in my Lumia 1020 and love it all over again every time I pick it up. A true sign of a classic. The Nokia N9 - perhaps more than any other device here, the N9 exudes character because it was effectively one of a kind. The only production device running Meego, the doomed high end replacement for Symbian that got axed in 2011 by Stephen Elop. The N9's hardware was similarly styled to the Lumia range ('fabula', etc.) but its interface, applications and potential was staggering. And much copied over the next 5 years by other OS - this was the original 'swipe UI' smartphone. 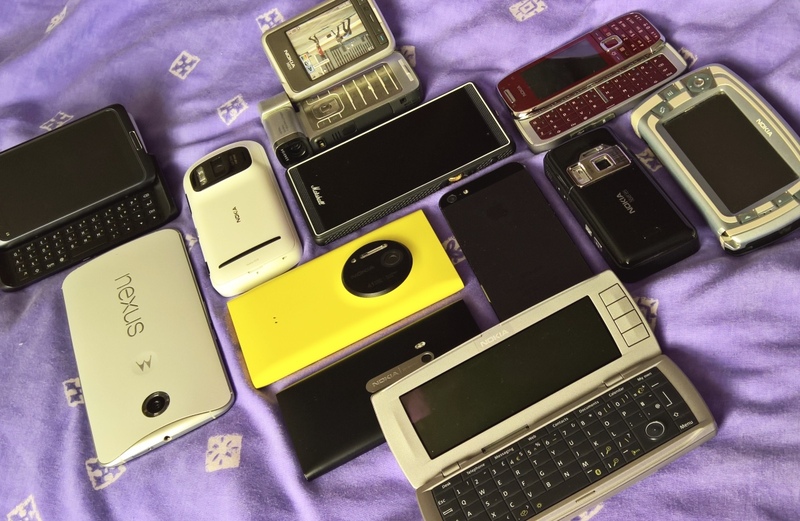 Other phones featured in the photo above include the Nokia E7, Nexus 6, Nokia 9500 Communicator, Nokia 7710 and Nokia 808 PureView. It's blindingly obvious that part of a phone having 'character' is that it is (or was) flawed in some way. If you think about 'characters' in films and on TV, the most interesting are always those with weaknesses and flaws, where you're rooting for them against the odds. It's the same with phones with character, there was always something to battle against, something to align yourself with the phone, fighting together to accomplish everything you need to do. It occurs to me, given the above admission, that I shouldn't be championing phones with 'character', by this definition - shouldn't I be celebrating phones which 'just work', doing nothing brilliantly but also nothing terribly? Yet there are a legion of those in 2016 and I can work up very little enthusiasm for any of them. Whereas here I am in 2016 writing eulogies for specific devices that are in some cases well over a decade old. In addition to the smartphones in the photo above, my (ahem) museum does extend to another 40 or 50 devices (going back to the earliest handhelds and palmtops), but I had to draw the line somewhere. I'd love to hear in the comments which smartphones from the last (say) decade that you consider to have 'character', phones which you (perhaps) named(!) and certainly fell in love with. Over to you!